Piles of rubble, partially collapsed buildings and crumpled cars strewn across a battered landscape. My eye falls on a blood-covered teenager, trapped under a concrete pillar moaning for help. Suddenly, his hand shoots up through the debris, clutching a mobile phone, and takes a surreptitious selfie souvenir of his role in this disaster exercise. Having presumably enhanced his photo with fluffy dog ears and nose, and posted it to Snapchat, he slips the device in his pocket and gets back into character. It is this sense of schizophrenic reality that we, as a comms team, found ourselves in when we made the decision to post social media messages from the world’s largest disaster scenario as if events were really unfolding. 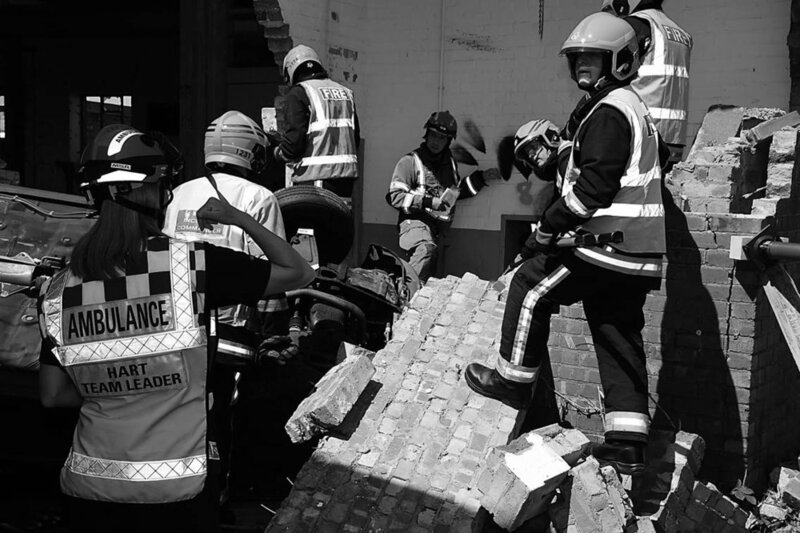 It is important to mention that we were VERY careful to take precautions to ensure that, while our ‘live’ reports were highly dramatic and realistic, people understood they were reading about an exercise. Bragging rights for our approach would be drastically reduced if we inadvertently sparked a county wide evacuation. This is not so unbelievable when you consider this extreme weather exercise featured more than 3,000 people and including a tropical cyclone, an earthquake, a tsunami and a terror threat. The first thing we had to be clear about was how this was to be achieved and via what channels. We opted for our Twitter and Facebook accounts, through which we have more than 50,000 followers. Our first job was to prepare people with a flood of posts in the run up to the event to explain what we were planning. We put these out at different times, in different ways, to hit different audiences to ensure there could be no confusion. A news release about the simulation was sent to media outlets, email subscribers and posted online with a screaming sub-heading explaining our plans. Our ‘live’ reporting took place on the second day of the three-day event. This gave us the chance to emphasise, both before and afterwards, this was an exercise. It meant that if our plans were scuppered by a real incident we could reschedule and… this was the day when a lot of the cool stuff was happening. On the day we started by sending out a comms-style ‘warning and informing’ tweet. This was a valuable learning point. Even with the communally agreed exercise hashtag, our own hashtags #MockApoc and #JustAnExercise and a Bitly link to our original story it could easily have been misinterpreted as real by someone just flicking through their tweets. For this reason we switched to a more journalistic stance, which would later give us much more freedom when it came to interviewing blood-soaked casualties etc. A colleague and I split up to cover the numerous locations as events were happening across the city with a frequently challenging and changeable timetable. The staggering efforts that had gone into making this exercise realistic and immersive were evident to me by the return of an emotion I had not felt for some time: journalistic anxiety. With more than a decade in the media, both as a local and national reporter, I started to feel that familiar sense of aimless nausea that I might miss something important or file copy later than a rival. The number of people involved also presented a challenge. You and your team may have a clear social media strategy laid out, you may have discussed this with all other agencies in a virtual media cell and done all manner of other impressive-sounding things. However, as soon as the action begins, you will see others from outside your circle tweeting with gay abandon having seemingly given no consideration of the factors involved. Someone, whose only involvement is getting squirted with red paint may inadvertently scupper your beautifully-crafted plan with a misleading message. We monitored messages throughout to ensure nobody thought this was a real incident. Reaction to our approach was extremely positive and many of those involved in the exercise adopted our MockApoc hashtag. We saw a significant rise in social media activity, with about 60,000 views of our content – about four times what we would expect on an average day. This is certainly something we would look to do again under similar circumstances. Hopefully we will not find ourselves dealing with such an incident in the county in real life but our ‘pretend’ coverage went down a storm.